Galeton, PA - West Branch Twp. Coming in to Galeton on Rte 6 from Coudersport, turn right on West St. (2002). Cemetery is a couple of blocks on the right. 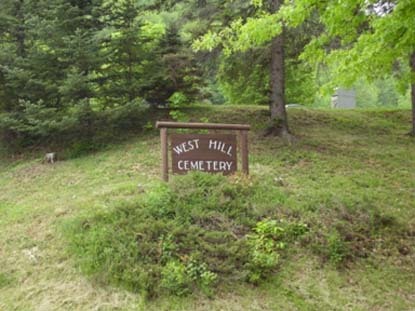 Thanks for the complete census of West Hill cemetery goes to Patsy Pifer - 2013. She spent years cataloging each stone and marker in the cemetery and she has graciously shared it all with us. We owe her a great debt of gratitude. Her hard work has added almost 2000 entries to the West Hill cemetery list. Where noted, some entries have been expanded with cross-references to Pike census data. To view the census data, open the census cited and search for a name. ACKERLY, Elliott. Spouse of K. Jean Karschner. Born 12-1-1916, died 7-3-2004. Age: 87 - Son of Robert D. and Esther (Johnson) Ackerly. Born in Babylon NY. AKERS, Carl R. [Rusty]. Born 3-18-1980, died 2-15-2008. Age: 27 - Son of David and Linda (LaBar) Akers. Born in Alomogordo NM. Died in a snowmobile accident. BALSILE, Virginia Mae (Thornton) [Ginny]. Spouse of Nicholas B. Born 9-30-1925, died 10-15-2011. Age: 86 - Dau of LaVerne A. and Grace (Dewey) Thornton, born in Marshalnds PA. Wed 4-12-1947 in Galeton, 3 children. BLISS, Kate M. (Hosley). Spouse of Adrain Rowe/ Merle. Born 12-12-1911, died 8-26-2009. Age: 97 - Dau of Harry H. and Mary (Coppersmith) Hosley. Born in Brookland PA, two children. BONFONTI,Olinto. Born May 25, 1914, died ? ?